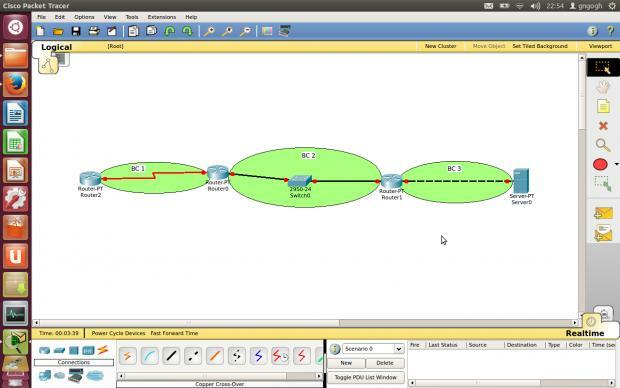 designing a network with 10 broadcast domains and 32 collision domains. pls help me. 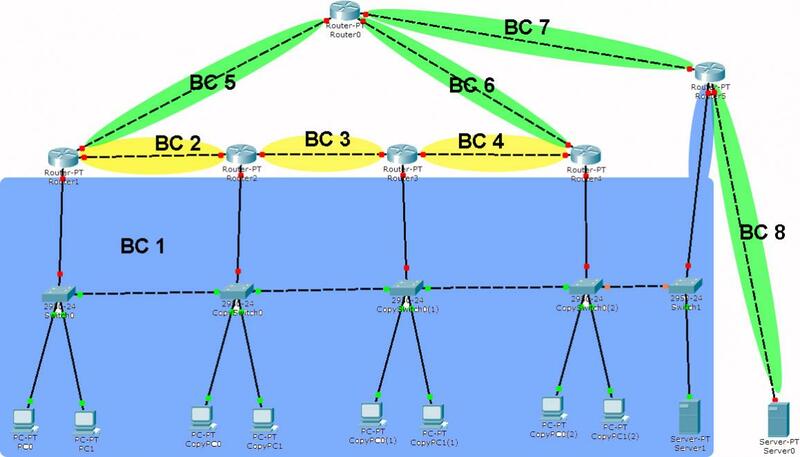 I have a homework which I need to design a topology in packet tracer with 10 broadcast domains and 32 collision domains and my network should have 5 routers 10 switches 2 servers and 16 workstations( pc printer etc,) I have trouble in how do I connect the routers and the switch because the switches. and also I have trouble counting broadcast domains. I am not sure if the server that is connected to a router is considered a broadcast domain? I only know is router divides broadcast domains and will have if it is connected to a switch with workstations. thank you. We could certainly provide a topology diagram for you but I'd hate to deprive you of an educational opportunity so instead I'll google a reference for you where others are trying to learn the same topic. now I understand that every device connected to the switch is counted as a collision domain but what if im going to connec my 2 server to each router? I that counted as a collision domain too? Does it specify you have to do that? Why not just connect them to the switch and if you want to separate put them in a different VLAN? because I need to use 5 routers and 10 switches. I do not know that I can connect a server in a switch too.. sorry for being a noob. I always thought that server needs to be connected in a router. You can certainly connect a server to a switch, at a basic level just think of a server as another device with a NIC. So there, pointers but didn't hand you anything really. 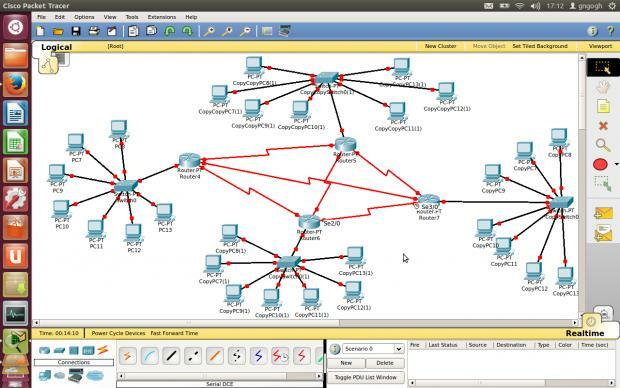 traffic flows in your network while you were half asleep, could you do it? Thank you so much guys for the very useful information! I know now what design should I do. Thanks again guys! how many collision domains??? 32??? you dont have 32 in there!!!! Ok. So this is my updated layout design. Can you please help me guys tell if my topology is right or wrong? And I have one more question, should I use crossover cable or serial cable in connecting my routers? Because I am confused when connecting both routers because I saw my instructor always use serial cable when connecting router to router but we can user normal ethernet cable right? I am sorry I am very new to networking. 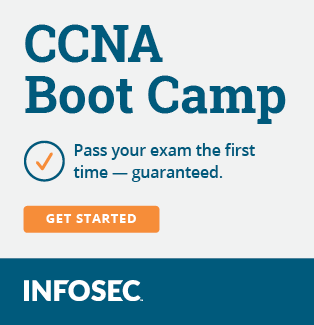 I am currently taking up CCNA 1.
you can use from router to router crossover, serial or optical. It would be 32 once the routers are connected. Ok. So this is my updated layout design. Can you please help me guys tell if my topology is right or wrong? This one is quite wrong. The previous design met the need, except the routers weren't connected. This one makes no sense. Physically, almost all the devices are on the same broadcast domain. but I need to use 10 switches and 5 routers... and 16 workstations..
so on my previous design I just need to connect all the routers? I don't need to connect the switches? I am not sure if im gonna make 32 broadcast domains on my previous design if I would just connect all the routers but I will try. Thanks for your help. understand what is a broadcast domain and collision domain... and then it will be easier. every connection from router to router is a broadcast domain, broadcast's stay within the network... they are not routed. A broadcast domain is a network. The routers are connected to switches which are in turn connected. Thus, all routers are on the same broadcast domain. The latest design is correct. Every connection is a collision domain, even if it is also a broadcast domain (e.g., between routers). I count 32 collision domains. Thanks ptilsen! Got it! I got one more question in my mind.. Was it right that I used copper cross-over on connecting the routers? Or I should have used Serial DCE cable? The two cables confuses me because sometimes I saw them using serial cables when connecting routers. Thanks again! That would depend on the routers in question and the application. I couldn't tell that from the diagram, and I'm no Cisco expert. I just understand the concepts well. That being said, my guess would be you should have used serial cables, which is what I've always seen used for CCNA labs. 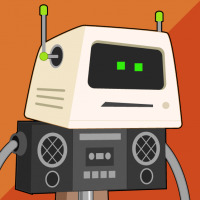 Conceptually, there's no reason routers can't be connected directly by Ethernet, and I've seen it in the field, but serial seems to be what's used for these labs. Ok. I understand now much better. Thank you ptilsen and more power to you! I have to say, this is probably the most useless assignment I've ever seen. Why design a network around a set number of domains rather than figure out the number of domains in a properly designed network? Oh well, glad you got it down though! broadcast to not travel from one interface to another, they are not routed, they stay within the network, do you know what a broadcast is???? a broadcast is a arp request for something... arp request are not routed!!! no two routers are in same broadcast domain even if they are in the same building. if you have two routers connected by a switch those interfaces are in the same broadcast domain, but the other interfaces of a router are not..
A broadcast domain is a domain in which a broadcast is forwarded. A broadcast domain contains all devices that can reach each other at the data link layer (OSI layer 2) by using broadcast. All ports on a hub or a switch are by default in the same broadcast domain. All ports on a router are in the different broadcast domains and routers don't forward broadcasts from one broadcast domain to another. The following example clarifies the concept. you should try a learn more about broadcast domains!!!! i think you dont understand the concept well, when you say all routers are in the same broadcast domain. Wow. I'm not sure I can help how incorrect your understanding is, but I'll try. 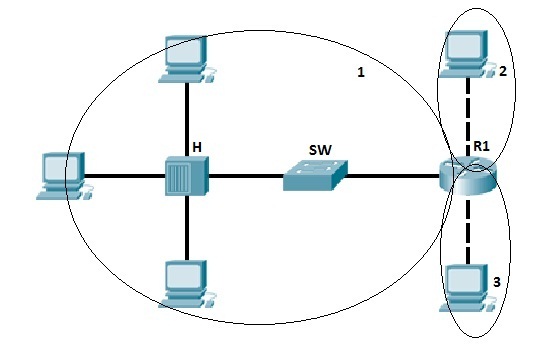 Routers on the same logical switched network are on the same broadcast domain, period. The switches in that diagram are connected to each other. That they are also connected to routers does not magically separate their broadcast domains. There are six broadcast domains in the pictured network, five between each router and one with every single device. Nothing needs to get routed to go from any router to any other router, because they are all connected by switches. you dont know that you are wrong, but ill try once more to clarify your understanding of broadcast domains.. this time i have ilustrated the diagram for you to see how many broadcast domains there are. Yeah, I see eight as well assuming it's a single VLAN. I have not disputed that there are eight broadcast domains. You're missing my point entirely. All routers except 0 are members of BC 1 in this diagram, which is a nonsensical design (outside of using VLANs, which are not represented here). That is my point. Of course there are additional broadcast domains between each router, but my point is that the routers (except 0) all have one interface that is on the same broadcast domain as all the others, which again, makes very little sense.